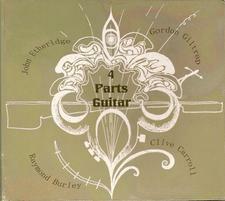 4 Parts Guitar is a quartet that has grown organically over the past few years. First there was the duo Double Vision with Gordon Giltrap and Raymond Burley. Gordon then had the idea of extending this duo format to a trio by inviting his old friend John Etheridge. Fortunately he accepted the invitation. To make things even more interesting and fun the last person to be invited, and to complete the circle, was Clive Carroll.